Whether or not you believe in ghosts, please join us for a stroll through by the eerie glow of candlelight. Within 90 minutes, listen to the stories of local history and haunts as we bring you to the sites where the departed are said to still linger. If seeing is believing, come and see for yourself. Offering tours in both Greensboro and Charlotte North Carolina! Join the Beyond the Grave tour in Charlotte, or in Greensboro take part in the Nightmares Around Elm Street tour! The highest rated tour company in Charlotte, Charlotte NC Tours consistently provides guests with an experience that leaves residents falling more in love with Charlotte and visitors wanting to relocate. 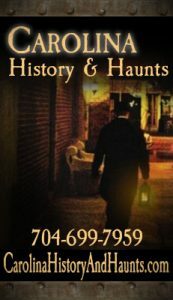 Charlotte NC Tours offers three varieties of Ghost Tours. The Haunted Walking Tour, Haunted Bike Pub Crawl, or the Haunted Segway Tour. the most haunted beach in America! OBX Ghost Tours is something your family will be talking about the rest of the summer! You’ll be entertained as a guide leads you through down town Manteo by lantern, telling the spooky stories that makes Outer Banks one of the most haunted beaches in America! Whether you believe or not you’ll enjoy your time at OBX Ghost Tours. Book now for the time of your afterlife!